The Tesla and SpaceX founder has quite an interesting backstory. Elon Musk is a name synonymous with many things: money, tech, vision. The entrepreneur is well-known for his most successful endeavors, especially electric vehicle company Tesla and space exploration company Space X. He’s known for his innovative ideas and, in particular, for his desire to provide clean energy to the world and create a new world for humans on Mars. But no matter how many things you may have heard about Musk and his futuristic companies, you may not actually know all that much about the 47-year-old co-founder and CEO of Tesla. Whether it’s about his South African childhood, his relationship with his mom or the details of his time eating only hot dogs, there’s plenty to learn about the tech mogul. 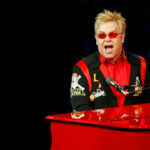 He was born in Pretoria, South Africa, on June 28, 1971, to a South African father and a Canadian mother. Musk is the oldest child of Maye and Errol Musk, having been conceived on their honeymoon. He has two younger siblings, brother, Kimbal, and sister, Tosca. Elon Can Credit Mom With Getting Him Closer To The U.S.
Maye married her engineer husband Errol at the age of 22 but divorced him nine years later. In order to support herself and her children, she continued to model on the side and, at one point, had five jobs. Although Musk went to live with his dad after the divorce, he pushed Maye to regain her Canadian citizenship when he was 17 years old. After she did, he received a Canadian passport within weeks. Although Musk credits his father Errol, an engineer himself, with why he’s “naturally good at engineering,” his memories of his dad are not good. Though he got his hands on his first computer at the age of nine and learned the “how to program” guide in just three days, it wasn’t until he was 12 years old that Musk developed his first business venture. That’s when he created Blastar, a “trivial game” he sold to a computer magazine for $500. Musk admits to being bullied until he was 15 years old, had a growth spurt and took up karate, judo and wrestling in order to learn to fight back. Still, the years beforehand were difficult for the bookish kid. In 1995, Musk and his brother, Kimbal, started Zip2, a company that provided maps and directories to online newspapers. Four years later, the two sold the company for $307 million. Musk took home $22 million of that sum. Despite co-founding X.com in 1999, the company that eventually became PayPal, Musk was ousted as CEO of the company amid boardroom squabbles and was against eBay’s acquisition of PayPayl. Despite his reservations, however, PayPal was bought by eBay for $1.5 billion and Musk walked away with $180 million after taxes. Adeo Ressi, Musk’s roommate at the University of Pennsylvania, recalled that the two rented a big house and would have as many as 1,000 patrons to their nightclub. However, Musk wasn’t really interested in the partying. After moving to Canada on his own at the age of 17, Musk lived at his mother’s cousins’ houses. In what might come as a shock to anyone who is well aware of his financial success now, at the time, he had to live on just one dollar a day. And so, he was often relegated to eating just hot dogs and oranges over the course of a day. The financial crisis was difficult for Tesla, which was not then the powerhouse company it is today. He struggled to keep the company from having to declare bankruptcy and almost went broke himself, until the end of the year brought good news. By Christmas 2008, Tesla had found investors, and SpaceX landed a $1.5 billion contract with NASA. Musk is concerned about artificial intelligence becoming a threat to humans, which is why he co-founded OpenAI in 2015. The nonprofit company’s goal is to do research to ensure that AI doesn’t destroy human life. Is there anything more “The Terminator” than that? Robert Downey, Jr., modeled his portrayal of Tony Stark on Musk. In fact, the film’s director, Jon Favreau, met with Musk and they decided to go ahead with the portrayal. But don’t worry, even though his reported salary from Tesla is just $37,000, the tech entrepreneur and CEO is actually worth $20 billion and could earn another $55.8 billion in stocks and awards if Tesla meets its current growth goals. Or at least that’s what we can assume from Musk naming SpaceX’s rockets after the Millennium Falcon, the ship owned by Han Solo that has been a part of several “Star Wars” franchise movies. Currently, SpaceX’s Falcon Heavy is the world’s most powerful rocket. Not only did Musk name SpaceX’s spacecraft “Dragon” after the hit song “Puff the Magic Dragon” by Peter, Paul and Mary, but he also named one of his sons Xavier (pictured on the right) after Professor Xavier of the X-Men. Musk met his first wife, Justine Wilson, at Queen’s University in Ontario. The two got married in 2000 but divorced in 2008. He began dating actress Talulah Riley shortly thereafter, and the two married in 2010 but divorced two years later. However, they remarried in 2013 before divorcing (again) in 2016. Not only did he propose to his second wife, Talulah Riley, after just 10 days together, but he has also expressed feeling brokenhearted after his most recent breakup with girlfriend Amber Heard. Apparently, the mogul needs love to be happy. “If I’m not in love, if I’m not with a long-term companion, I cannot be happy,” Musk told Rolling Stone. The billionaire created his own school called Ad Astra, which is Latin for “to the stars,” in order to educate his kids. Located in southern California, the school houses 20 students, but not much else is known about it. It’s shrouded in secrecy, though Musk has described the school as one that caters to students’ individual aptitudes and uses real-time, problem-solving methods to teach critical thinking. In 2002, Musk and his brother Kimbal started The Musk Foundation, which focuses on four key areas, according to their website: renewable energy research and advocacy, human space exploration research and advocacy, pediatric research and science, and engineering education. The foundation has given money to Doctors Without Borders, National Wildlife Federation, Sierra Club Foundation, the Clinton Foundation, Oceana and more. Although he loves all things science fiction, Musk’s favorite book is Issac Asimov’s “Foundation.” In fact, he credits the book with being “brilliant” and the reason why he wanted to go into space in the first place. It’s also through this book that he learned that every civilization will one day falter. Perhaps that’s why he is so eager to get to Mars? Luckily for the billionaire, his favorite novel is now being turned into a television show by Apple. In January 2015, Musk appeared as himself on an episode of one of his favorite animated shows, “The Simpsons,” and it was quite a sight to behold. After the entrepreneur blasted off into space on the Dragon craft, Lisa Simpson noted that “for a man who likes electric cars, he sure burns a lot of rocket fuel.” Although it was said in humor, Musk took to Twitter to explain the science behind why using an electric rocket to reach orbit would actually be impossible. After his son asked him what his favorite animal was, Musk tweeted that it is “of course” the Ravenous Bugblatter Beast of Traal. In a rare Reddit AMA (Ask Me Anything), Musk answered some questions for fans just before the launch of the Falcon 9. When he was asked about his favorite food and alcoholic drink, he said: French and BBQ and whiskey. He also revealed that he sleeps six hours a night and that his best daily habit is showering. Musk’s sister Tosca is a filmmaker and his brother Kimbal is an entrepreneur himself. Not only has he been a part of some of Musk’s ventures, such as Tesla and SpaceX, but he is also a restaurateur who focuses on sustainable, healthy, farm-to-table fare. Musk and his first wife, Justine, had six children together. Their first son, Nevada, died at 10 weeks old from Sudden Infant Death Syndrome (SIDS). The former couple has five sons today, one set of twins and another set of triplets. 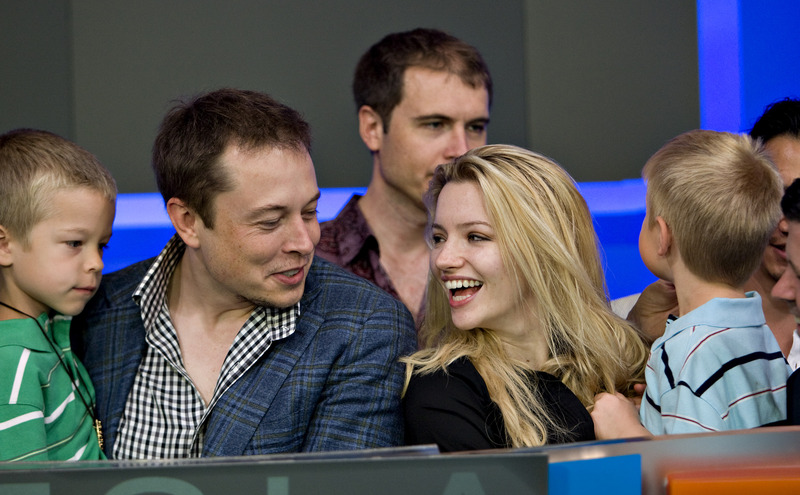 Twins Xavier and Griffin are pictured below in 2010 with Musk and stepmom Talulah Riley. Justine Musk has several published fantasy novels under her belt and has also given several inspirational TED Talks. Musk has been in a long-term relationship with Matt Peterson, who was a friend of her and Elon’s while they were married. In November 2015, Musk appeared on the CBS comedy in an episode titled “The Platonic Permutation.” He appears briefly in a scene in a soup kitchen over Thanksgiving, which features him washing the dishes. “I was on the turkey line, but I got demoted for being too generous with the gravy,” Musk said on the show.